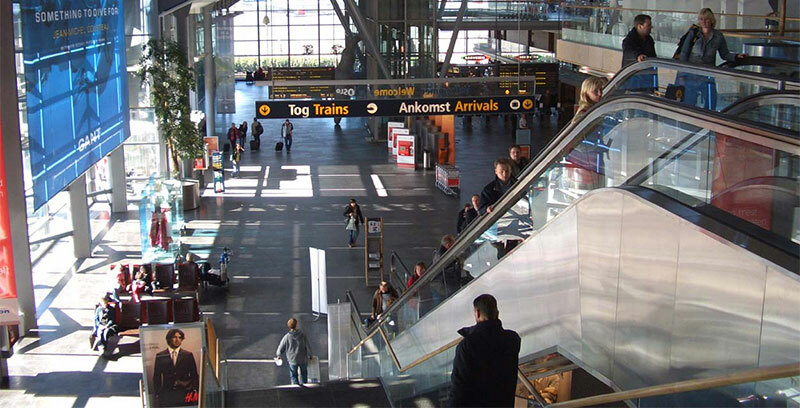 When you fly into Oslo Gardermoen Airport, you have two different train options that will get you to the city center. Both go to the exact same central train station. Both take about 20 minutes for the ride. However, one is considerably more expensive than the other. None of these facts were adequately researched before our arrival. Instead, I used the information from the hotel website on how to get from the airport to the hotel. When you arrive in Oslo and want to catch the train into the city, you’ll find the trains at the far end of the airport right past the 7-11 and the Starbucks. There are ticket windows as well as automated ticket machines. If you have an American credit card, then note that it will not work in the machines – even if you have one of the chip & signature cards. This means that you need cash. Find the nearest ATM on the backside of the Starbucks under the stairs/escalator that go up to the arrivals level. This was the option that we chose upon arrival at the airport. The cost for a ticket is 170 NOK, which is around $28 USD. This train seems to run more frequently than the NSB train. After researching it online, this is the option that we chose to take for the ride back to the airport from Oslo’s central train station. The cost for a ticket on this train is 90 NOK, which is around $15 USD. Since this the cheaper option, it was considerably more crowded than the Flytoget train. And, two Flytoget trains left the station in the time that we were waiting for our train. So, if you’re in a rush to get to the airport (or the city), then Flytoget is worth the extra cost. Otherwise, this one is better for your budget if you don’t mind the crowds on the train. Thank you so much for this information! I am traveling with a broken foot and can’t climb stairs. Do you think I’ll be able to use the NSB train? Yeah, I think you’ll be okay with the with train. I seem to recall escalators in the train stations. And I don’t think I rode any double decker trains with stairs, like they have in Paris. Have fun!